I made these tarts after a week of shooting my third book and making 18 recipes (giving myself a little pat on the back). It's been too long since I shared a recipe on the blog, my apologies! Even after making a gazillion recipes, I was totally in the mood to make one final recipe... and then I crashed. Did you see the state of my kitchen on Friday? It took us 2.5 hours to clean up so you can imagine why I didn't move from the couch on Friday night!! But lucky for me, I got to nibble on the fruits of my labour while Netflixing with my hubs. I wish my words could adequately describe it. I will try... it's tart, sour, sweet, fresh and bright. Like an explosion for your salivary glands. This recipe was a welcome change from all the chocolate I've been eating ALL. WINTER. LONG. Don't get me wrong, I'm not over chocolate or anything, I was just ready for something light and fresh, even if spring isn't here yet. With this new recipe you'll make spring happen in your kitchen even if you've had a long winter like we've had in Ontario. Today, as I'm writing this blog, was the first day we've had sunshine in forever! Another reason I love this recipe is that yellow is tied with turquiose as being one of my forever favourite colours! It's one of those colours I feel amazing when I wear it (cue my favourite sweater) and when I need a joyous boost, I make this Turmeric Lazy Lady Latte or my Turmeric Butternut Squash Soup! So obviously, just looking at these photos after we took them made me feel JOYOUS! 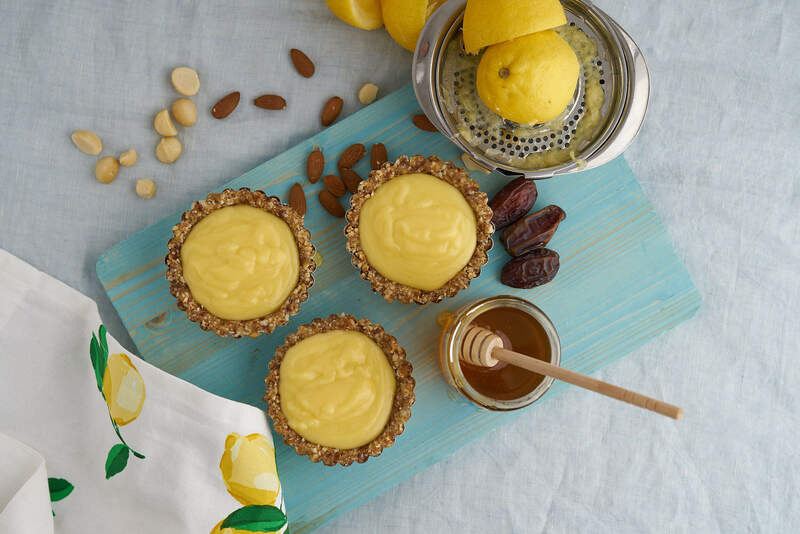 This recipe is a no-oven-no-bake recipe -- hurray! You will have to turn your stove top on to make the curd (topping), but just listen to some good tunes while you're waiting for the topping to thicken. You can do this while the crust is setting in the fridge or freezer. To make the bottom, you could use any nut. I used macadamia nuts and almonds. I got the inspo for this recipe from Chalkboard Magazine's recipe but I nixed the oats in their version because I feel better these days with very little grains in my diet. For the curd, I used honey, but before you lose your mind and comment... "but Joy, I thought we are not supposed to heat honey", allow me to splain. I used honey because I wanted to maintain this gorgeous colour. So it was purely for vanity reasons, lol. Now you're NOT GOING TO DIE, eating heated honey. The reason it's not recommended to heat honey is that it will denature some of the enzymes, but for this recipe, I broke the honey rule. But I did use the BEST HONEY EVER. Now for this splendid recipe! 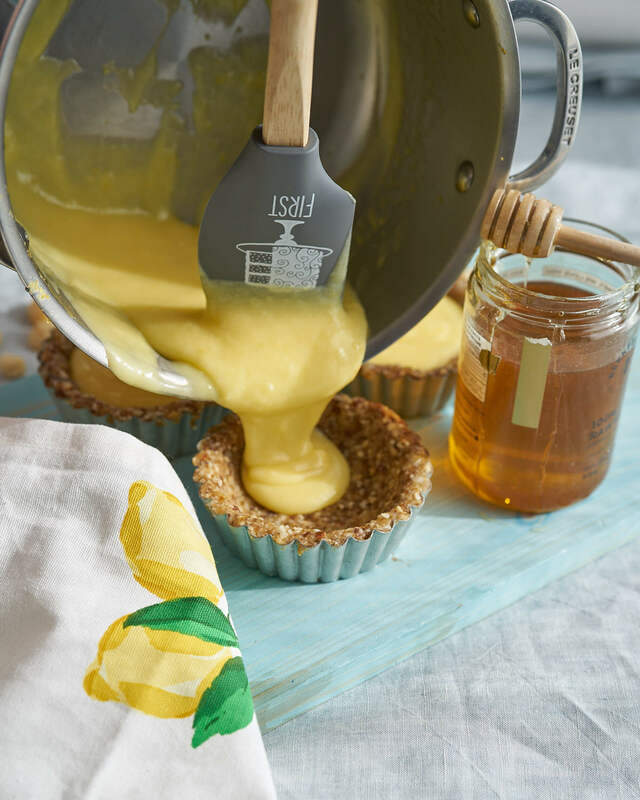 Once the bottom crust is set, pour the lemon curd mixture into each cup. Put back in the fridge or freezer and wait until it's set to enjoy. It will take about an hour in the freezer and a couple of hours in the fridge. There you have it! I suggest you sprinkle a few toppings like mac nuts, coconut flakes and a schlop of coconut yogurt. Alright, that's it from me friends. I'm off to go enjoy another one. Where can I find coconut butter? What else can it be used for? Thanks. Are these raw macadamia nuts? Would it work with roasted (unsalted) nuts? I need to make them for a mama who can’t eat raw nuts. Such delicious creamy tarts 😋 I love when you use the honey for the curd, the flavor must be so good! Now I have to go find coconut butter (lol). I almost had all of the ingredients. Looks great. 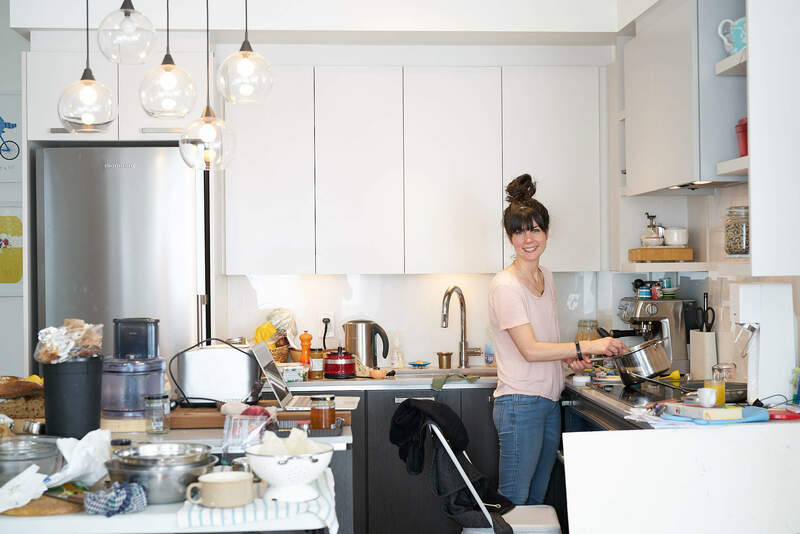 Well, I'm just glad to see a kitchen that looks like mine when I cook! Those look tasty; can't wait to try them! 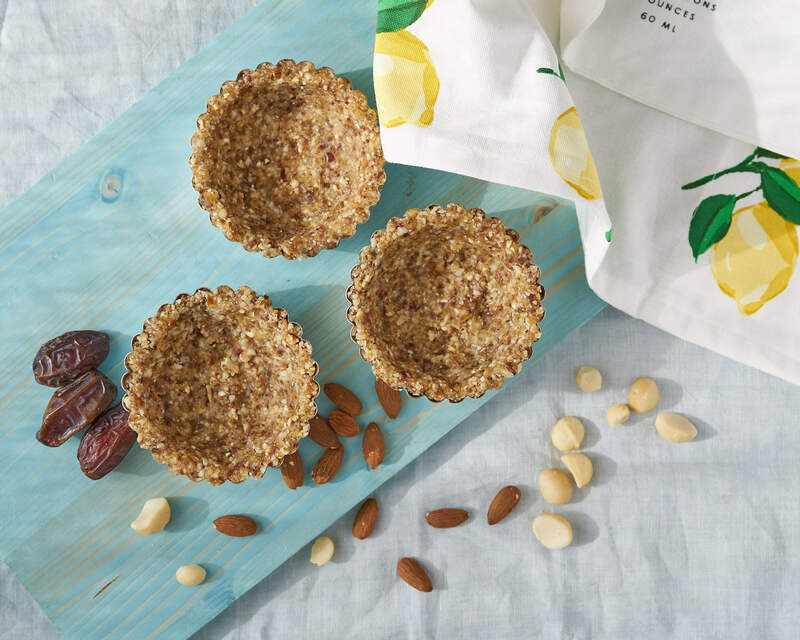 Hi, Are you able to use an egg substitute (like flax seed eggs) for this recipe? What size of tart tins did you use? 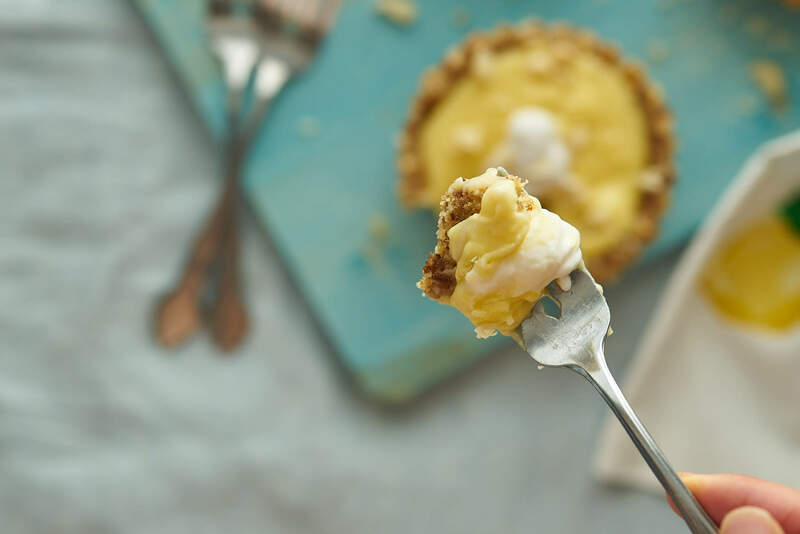 If I wanted to make it in a single large tart pan for Mother’s Day, would you suggest doubling the recipe?! Thank you! What could I substitute the coconut oil and coconut butter with? Joy, I have one of your books and have been cooking along with you for several years now for my young family. 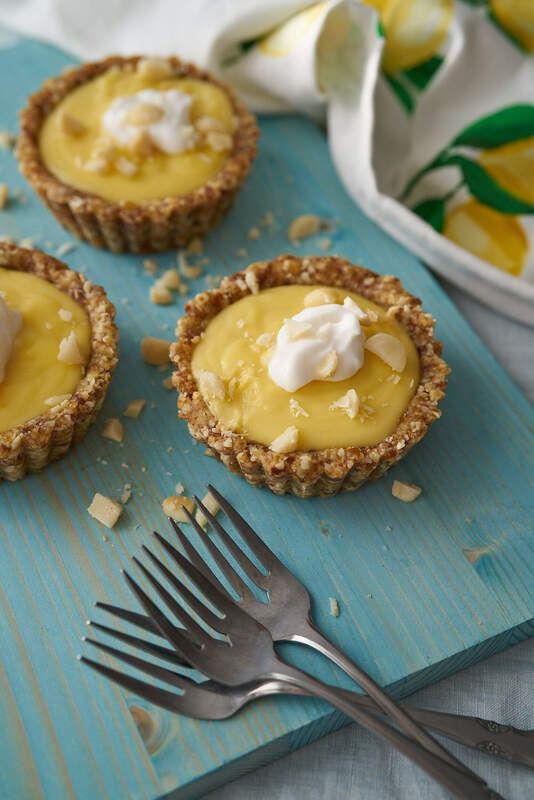 This recipe had everyone smiling and giggling with the sumptuous flavor of the tarts. For other readers, I substituted organic butter for the coconut butter since it wasn't on hand. I also added 2 drops Lemon Essential Oil (certified for consumption)to the cooking custard. Thank you for sharing what you love and making all of our lives a bit richer in the process! Blessings! My Gourmet Ladies cooking group made this and everyone thought it was delicious! I wonder what the tart shell would taste like with your chocolate mousse recipe? Hi Liz! Glad to hear they loved it :) It would be really delicious, I assume you're talking about the Chocolate Chia Mousse? That would be a wonderful combo. Let me know if you try it! You can but just keep in mind some of the properties of the honey will be destroyed by the heat but it doesn't create any harmful compounds whatsoever. Enjoy! So delicious Joy! 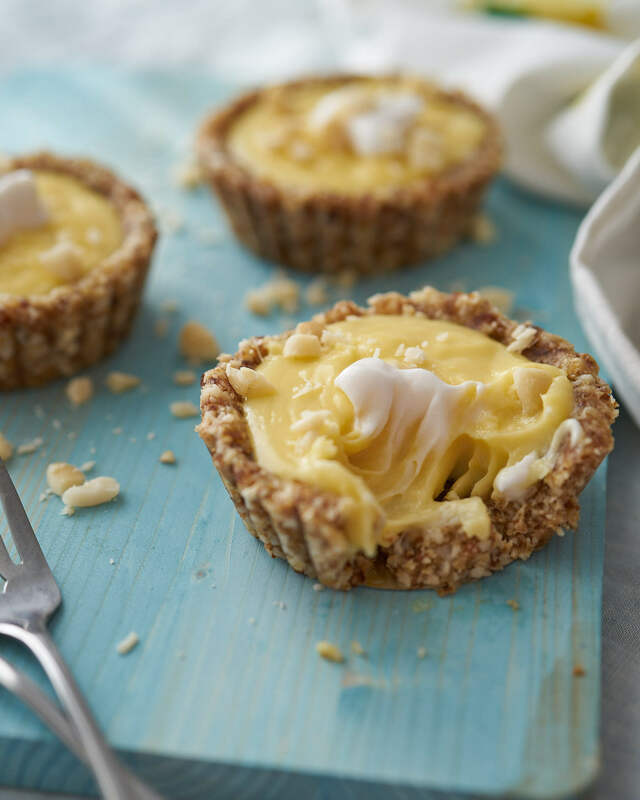 I have made these tarts twice for company and they both asked for the recipe! :) Thanks again for another amazing recipe! Btw I used raw cashew nuts instead of macadamia nuts and it was still delish! Glad you love it Sandy and thanks for taking time to comment. Cashews is a great swap and much more affordable than mac nuts, thanks for that suggestion! Will the recipe still taste and hold up well without the use of honey? Unfortunately, I can’t have honey while pregnant. I’m rarely motivated to bake these days but these little gems awakened my desire! Thanks! Do you think this could be made with flax seed replacement for eggs? Making a curd is pretty tricky, so I don't think flax would work. 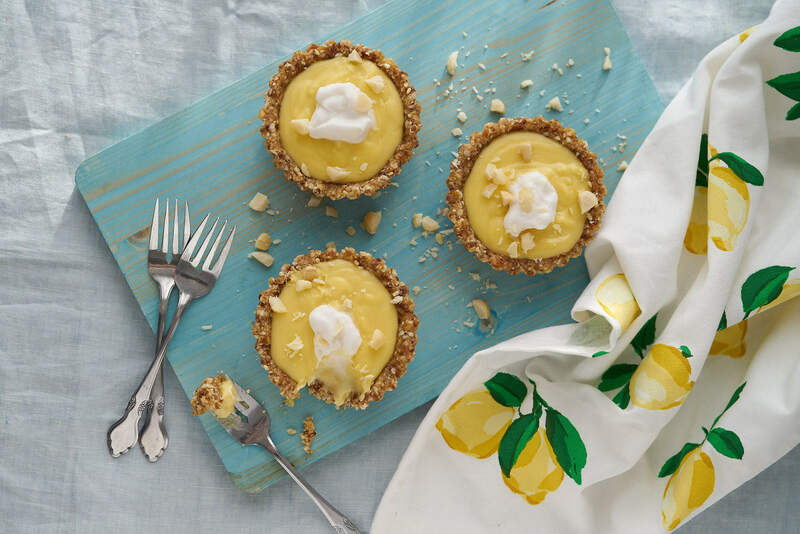 However, you could try this recipe: https://minimalistbaker.com/vegan-lemon-curd/ and them pour it into the crust in my recipe. Let me know how it turns out! The eggs are not cooked, thinking not to eat raw egg? That's really up to your discretion. I definitely avoided raw eggs while pregnant but this I would have eaten because it is tempered and cooked over 15 minutes. It's up to you. You can always buy premade curd. Can I substitute something for the coconut butter? I have the oil, but haven't seen butter. You can but you won't get that rich creamy taste that you can get from the coconut oil. Instead you could do spoonful of full fat coconut cream from a can of coconut milk. If you go to Homesense or any kitchen store you can find tart pan tins like these ones with a removable bottom making them easy to pop out and put on a plate onces they've set. Enjoy! i don't have individual tart pans like those...could we use a muffin tin instead??? Yes and actually, you could probably use a square pan as well to make a large one. You'll likely get more than in a muffin size because they are smaller. Thanks! Hope you love them! You could try using your blender if you have one. Blenders are just tougher for pulverizing nuts and dates. Alternatively, you can get a mini food processor probably on sale from Walmart or Canadian Tire for under $30 and then you've got it for so many recipes, totally worth it! Hi Joy, can you make this recipe the day before consuming but keep it in the fridge, or will the crust go mushy?